Dear readers, I am writing today with two goals in mind. One is an overreaching, transcontinental, meta-social-media idea that I am sure every one of us has thought of before, and the second is a humble offer to help in any way I can. Let me start off with an anecdote which will speak to that first goal. This is purely hypothetical (and not in the ironic I'm-asking-for-a-friend kind of way. Truly hypothetical). You are a Jalopnik reader with an interest in all things wagon-y. However, you are too lazy to shift your own gears, and are not really concerned with reliability. You have more time and money than you know what to do with. So naturally, you are looking for an Audi Allroad. With the vaunted deprecated storied twin-turbo 2.7L. And then you find it. A beautiful 2003 example, with everything you are looking for - two tone exterior and interior, tape deck, probably a cup holder...and the owner even says, "MINT NOTHING WRONG" right there in the title! Additionally, and totally unsuspiciously, the owner exclaims once more in the body of the ad, "It's absolutely mint! Nothing at all is wrong with the car!". While calling the car "mint" once would warrant an eye roll, insisting on it multiple times raises one's guard. Anyway, back to the anecdote. You may have questionable taste in leather color and make interesting value judgments, but you are no fool (or at least, not a complete fool). You want to check out the car in person before reaching for the checkbook. But here's the rub, and the point that I, the author of this wordy post, neglected to make until 278 words in - you live in Vancleve, Kentucky and this Audi lives in Ledyard, Connecticut. You can probably guess where this is going, so feel free to stop reading and proceed to the comments to let me know what you think. If you'd like to hear me out, proceed. We can come together as an auto-loving (no, not that kind of autoloving) community to help each other out when a buyer can't perform the necessary pre-purchase inspection themselves. 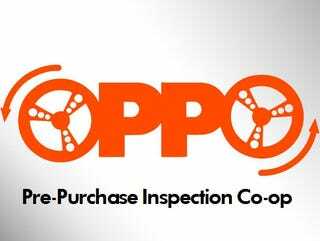 The Oppo Pre-purchase Inspection Co-op (OPPIC? OppoCo?) would merely be a directory of enthusiasts, their location, their specialties, and their contact info. We will help out however and whenever we can, across make and model lines, without charge or expectation of compensation, just for the love of cars. And hey, down the line when we want to make a long distance purchase, maybe we will benefit from another kind Jalop. I look forward to seeing how/if this works out - what do you think?